Jerry Moss with newly named Ziconic. Photo by Kyle Acebo. Team Z is proud to announce that Zenyatta’s chestnut colt by Tapit has been named. 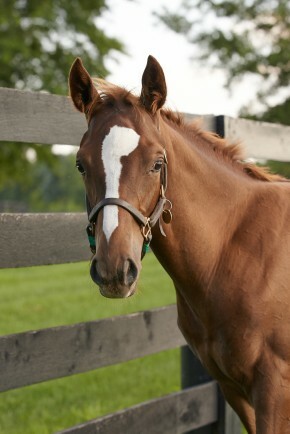 Inspired by the iconic Zenyatta herself, Jerry Moss has chosen the name Ziconic for her second colt. Portrait of Zi, now available in the Shop. To celebrate the new name, we are releasing this portrait of Ziconic in the Zenyatta Shop. Enter ZICONIC at checkout for free shipping to the US on all prints. This promo code will remain valid as long as Team Z is at Lane’s End awaiting the new addition to the Z family. Dear Tiz Herself. Great to see her up on her feet and already has 144 friends ,the sky’s the limit for our little princess!Hugs Sheena. Dear Team Z, and dear Z fans. Tiz Herself — Thanks for letting us know about Z14’s Facebook page! It’s great to see her white blaze–larger than her mom’s, I think. Thanks to Janet Newman, too, for posting the link to the story on Zenyatta. I haven’t watched it yet, but I’m sure I’ll enjoy it. 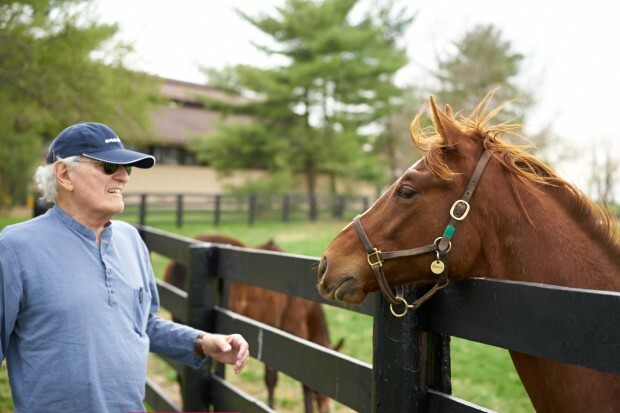 Jerry , a great name for the chestnut colt by Tapit. I hope the references to Zenyatta continue for all of her foals. thanks for all the special memories and sharing Zenyatta with her fans. Love hugs and kisses to all on this special day.